Vibrant shades of pink and yellow burst forth from this potted miniature rose gift, capturing the essence of spring and exemplifying feelings of love and friendship. The beautiful yellow container in which these beautiful blossoms arrive bears a floral design with hummingbirds and butterflies, and makes a delightful centerpiece. 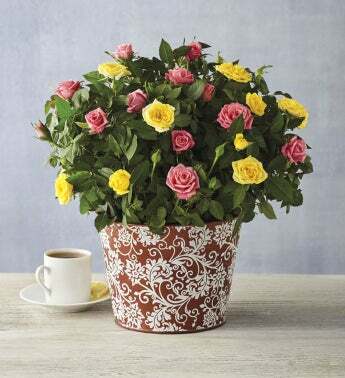 Care instructions are included to help your mini roses thrive long after they arrive.